Fig. 191 Upward-sloping demand curve. 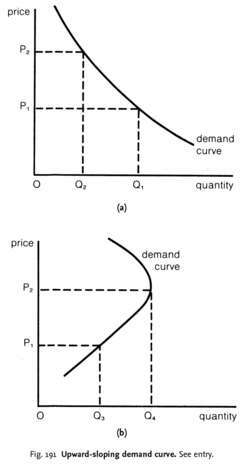 a DEMAND CURVE that shows a direct rather than an inverse relationship between the price of a product and quantity demanded per period of time, over part or all of its length. Most demand curves are based on the assumption that consumers are rational in buying products and have full knowledge of price and product characteristics. Where either of these assumptions is modified then the DEMAND FUNCTION can result not in a normal product as in Fig. 191 (a) but in an upward-sloping demand curve as in Fig%. 191 .
or because the product is a GIFFEN GOOD. See also INCOME EFFECT, ENGELS LAW. This leads to an upward-sloping demand curve for housing. The upward-sloping demand curve is the result of an externality. On the demand side, a similarly constituted externality can produce the upward-sloping demand curves that are thought to be produced by preferences such as desires to mimic the behavior of others. For fruit juice, however, in this study, the upward-sloping demand curves suggest that these consumers did not find the brands substitutable for one another and hence these consumers were less sensitive to moderate price differences. Restaurant eating and attending a concert (Becker 1991), housing (Dusansky and Wilson 1993), conspicuous consumption goods such as fashionable clothes and jewels (Veblen 1934; Corneo and Jeanne 1997) are examples of goods that may exhibit upward-sloping demand curves. 2004) reflect this empirical foundation by showing mixed relative demand curves for purchasing data from individuals as well as aggregated across purchasers and stores, where the regression lines show either neutral, downward-, or upward-sloping demand curves.